Elle’s birthday is coming up. It’s hard that her birthday is shortly after Christmas and New Year because it doesn’t give me much time to plan for a party. That’s one of the main reasons why I haven’t done a big party for her yet and this will be her third birthday. Plus it’s because she is the second child. By this time I have realized that they don’t need a big party each birthday. I thought about maybe doing the party somewhere other than our home like restaurant, museum, etc. But it needs to be somewhere not too expensive since we are just coming off the holidays. Any ideas of places to have a fun birthday party for Elle who will be 3? How about an idea for a theme? Elle likes princesses, dress up, Buzz Lightyear and all sorts of other girly stuff. But there will be boys at the party too. 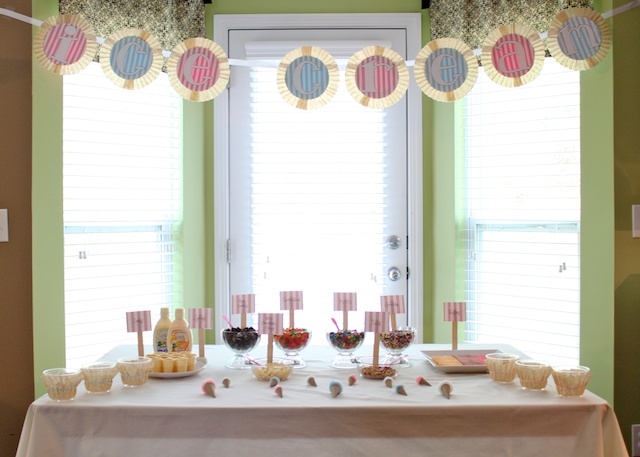 Guests to her party will consists of boys and girls her age or around her age. What are some exciting activities to do with them? What kind of food to serve picky 3-year-olds? The party will probably be around lunch time. Lastly, what about the cake? Are you are a store bought or homemade cake kind of person? What kind of cake should I make or buy? The image above is from Kaye’s ice cream party two years ago. For a 3 year old party, I would stay at home — too much work to coordinate all of the booster/car seats in order to go somewhere. I’ve found that kids like the classic games we played as kids: pin the tail on the donkey, musical chairs, simon says. We had a Toy Story party for my son’s birthday with both girls and boys attending – it was a blast! We played pin the badge on sheriff Woody and did an army man hunt (like an Easter egg hunt, but with plastic army men from the dollar store). The kids also did a coloring sheet and played with Mr. Potato Head. I blogged about it here http://adorableoriginals.blogspot.com/2011/08/toy-story-party.html There are tons of great cake ideas http://www.coolest-birthday-cakes.com/ for any themed party! My husband is a volunteer firefighter. In Indiana (maybe all over) a volunteer station is considered part of the community for limited public use. I know they’ve hosted several birthday parties in one of their large conference rooms and in the truck bays. What kiddo doesn’t love climbing all over a fire truck? Who doesn’t love kiddie parties! My favorite part is decorating, cooking (helping in the kitchen is more like it) and watching all the kids have a great time! Love outdoor parties, but if you have plenty of space indoors, it’s fun always fun to get creative!